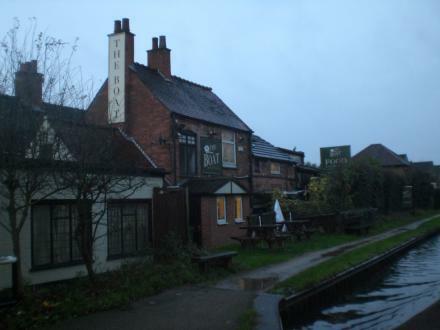 The Boat Inn (Minworth) is a minor waterways place minor waterways place place on the waterways major waterways place village town city on the Birmingham Canal Navigations (Birmingham and Fazeley Canal - Main Line) between Drayton Manor Bridges (There are two bridges here, a foot bridge and a swing bridge. These days the swing bridge is usually open.) (7 miles and ½ furlongs and 11 locks to the northeast) and Dickens Bridge (Minworth) (½ furlongs to the west). The nearest place in the direction of Drayton Manor Bridges is Old Kingsbury Road Bridge; a few yards away. First Ave, Sutton Coldfield, B76 1BA — 1233 yards to the west. Old Kingsbury Rd, Sutton Coldfield, B76 9AE — 16 yards to the southwest. Prologis Park Midpoint, Midpoint Way, Minworth, B76 9BJ - SATNAV — 1031 yards to the south. Birmingham — 1112 yards to the southwest. Sutton Coldfeld, Sutton Coldfield — 1018 yards to the east. 156 Cheswood Drive, Birmingham, B76 1XY — 904 yards to the west. Forge Lane, Minworth, B76 1AH — 1006 yards to the west. Birmingham — 1346 yards to the southwest. shawberry anvenue castle vale, Birmingham, B35 6QU — 1484 yards to the southwest. Birmingham — 1007 yards to the south. Dudley — 675 yards to the northeast. Kingsbury Road, Sutton Coldfield, B76 9DD — 352 yards to the east. Unit D1, 187, Park Lane, Birmingham, B35 6AN — 891 yards to the south. St George's Church, Water Orton Lane, Minworth, B76 9BU — 164 yards to the east. St Gerard Majella Catholic Church, Birmingham, B35 6JT — 1255 yards to the southwest. 46 Thornley Grove, Minworth, Sutton Coldfield, Birmingham, B76 9RH — 153 yards to the north. Minworth — 837 yards to the west. Tipton, DY4 7NW — 359 yards to the southeast. Minworth — 675 yards to the northeast. 32 Marfield Close, Sutton Coldfield, B76 1YD — 1313 yards to the west. Birmingham — 1397 yards to the west. Onsite Marketing Suite, Minworth Trade Park, Birmingham, B76 1 — 1161 yards to the west. 2 Renfrew Square, Birmingham, B35 6JT — 1214 yards to the southwest. Birmingham — 739 yards to the south. castle vale, Birmingham, B356JB — 944 yards to the west. Sutton Coldfield, B76 — 1018 yards to the east. Robinsons Way, Birmingham, B76 9BB — 505 yards to the southeast. Birmingham, B76 1XG — 1383 yards to the northwest. Birmingham — 1115 yards to the southwest. Kingsbury Rd Curdsworth, Birmingham, B76 9DP — 1428 yards to the east. Birmingham — 1280 yards to the southwest. Sutton New Hall, SK11 0 — 1494 yards to the northwest. Birmingham, B35 6 — 1321 yards to the southwest. Kingsbury Road, Minworth, B76 9DD — 341 yards to the east. Birmingham, B35 7NL — 1313 yards to the southwest. Castle Vale Stadium, Birmingham, B35 — 1561 yards to the southwest. 53 Coleshill Industrial Estate, Station Road, Coleshill, Birmingham, B46 1JT — 900 yards to the south. Unit 23 The Greens Business Park, Sutton Coldfield, B76 9DD — 596 yards to the east.